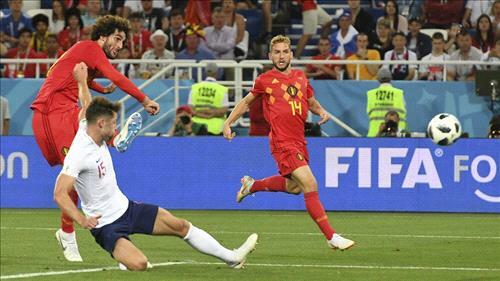 AMMONNEWS - It had been viewed as the game no-one wanted to win but Adnan Januzaj’s fine finish early in the second half gave Belgium a 1-0 victory over England to secure top spot in Group G as both sides made wholesale changes to their lineups. The result means Belgium, who won all three of their group games to finish on nine points, will face Japan in the last 16 while England, who finished second with six, take on Colombia. All the pre-match talk had been about whether second place might offer an easier path to the semi-finals, given that the group winners could face Brazil in the last eight. If that was a consideration then Gareth Southgate’s England side can take some consolation from the defeat given that it offers a potential quarter-final against Sweden or Switzerland rather than Brazil or Mexico, who could await Belgium. There is, though, something presumptuous about such talk and Colombia, a team with plenty of talent, certainly won’t appreciate being considered part of an ‘easier path’ to the quarter-finals. As expected both managers utilised their squads to the full -- Belgium’s Roberto Martinez switching nine players and Southgate bringing in eight from his reserves, a decision he had described as a ‘no brainer’ in the circumstances. Belgium created the better openings in a poor first half while England showed greater urgency but a lack of finesse in the final third. England then pushed on looking for an equaliser but, without their rested talisman Harry Kane they lacked a cutting edge. Marcus Rashford had the best chance but his shot was already wide of the target when Thibaut Courtois got his fingertips to the ball. Belgium came close to a second goal in the final minutes when Jordan Pickford made a fine, diving save to keep out a rasping Dries Mertens effort.